As expected, Apple appears to have bumped the available RAM in its latest handsets from 1 to 2 gigabytes while doubling that for the new jumbo iPad Pro, the numbers seemingly confirmed by a clever application of Xcode's iOS simulator. 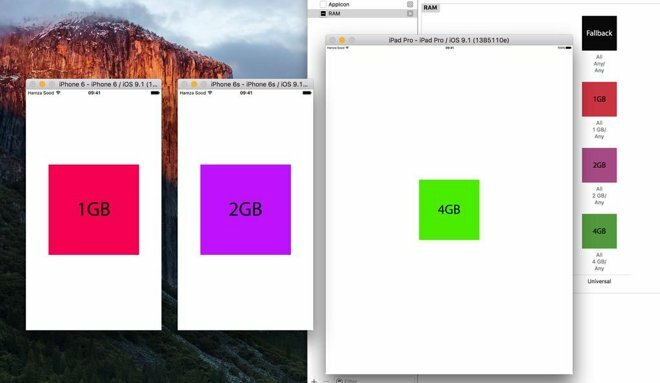 Developer Hamza Sood made the discovery by running a small test application containing three images, which are included or excluded dynamically based on the amount of RAM available. Though the app was run in the iOS simulator, the results should be identical if run on a device. The original iPhone packed just 128 megabytes of RAM, doubling that for the 3Gs and again for the iPhone 4. The iPhone 5 was the first to receive 1 gigabyte, a number which did not change for the 5s, 6, or 6 Plus. Apple did switch from LPDDR2 to LPDDR3 for the iPhone 5s and 6, making the memory slightly faster. It's not clear yet if the new iPhone 6s and 6s Plus continue with LPDDR3 or if they've switched to memory compatible with the nascent LPDDR4 specification. The iPad, meanwhile, hit 1 gigabyte with the iPad 3 in 2012. That was finally increased to 2 gigabytes with the iPad Air 2, though— like the iPhone— the tablet did switch to speedier LPDDR3 in the interim. Adding 4 gigabytes of RAM to the iPad Pro could be a sign that Apple anticipates heavy use of side-by-side multitasking on the larger device.